This summer, student leaders and almost 1,900 petitioners saved Gelman Library from a troublesome fate of not being open to students 24 hours a day, seven days a week during the fall semester. But if you’re afraid those hours won’t last and want to find a new late-night study spot, there are plenty of spaces across the city that are open late where you can cram for your exams. Want to study for a midterm without leaving your seat in search of caffeine? 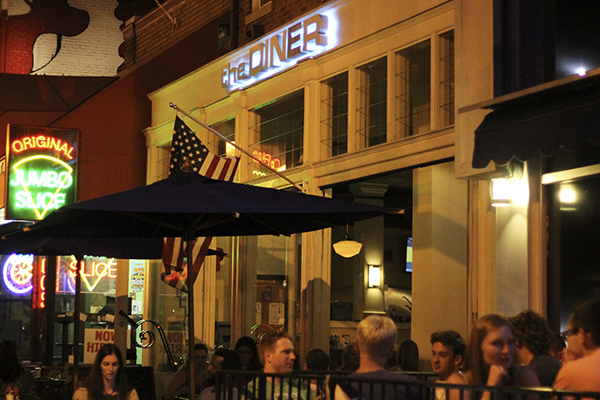 The Diner, just a quick walk from the U Street Metro station, is the perfect spot to combine diner coffee, an assortment of pies and a late-night study session. Serving a full breakfast, lunch and dinner menu 24/7, The Diner gives night owls a study spot away from the Foggy Bottom bubble. And you can celebrate finishing that research paper with a mimosa, which The Diner serves for $7. Be sure to order a side of their home fries, which are perfectly crunchy and more like a tater tot than a soggy potato. Don’t want to spend a warm fall night in Gelman, but still need to finish some last-minute reading? The steps of the Lincoln Memorial are a great place to study at all times of day, but are much less crowded after midnight. The steps closest to the statue of Lincoln provide the most light after the sun goes down, so you can cozy up next to the 16th president with chapters of class reading and avoid the harsh, fluorescent lights you’d be forced to endure at Gelman. This Dupont Circle staple is known for its late-night hours and yummy desserts, but the bookstore and cafe is also a great spot to have something more than a snack while you finish up a last-minute essay. After browsing the bookstore for the textbook you put off purchasing, grab a table and order one of Kramerbooks’ famous desserts, like a rustic apple tart ($8.75). If you need the soft jazz piped into a Starbucks to help you study during the early morning hours, the chain coffee shop has a location in Georgetown open 24/7. While this Starbucks is out of walking distance from campus, late-night access to Pumpkin Spice Lattes and free Wi-Fi is worth the short cab ride. Looking for some heavier fare while you dig into a semester’s worth of reading? The Coupe’s late-night menu offers burgers, fried chicken, and macaroni and cheese, as well as vegetarian, vegan and gluten-free options. A quick walk from the Georgia Avenue Metro station, this French-American cafe is perfect for when you want to get far from campus. While we wouldn’t recommend studying for a midterm in the aisles of this campus hole in the wall, 7/11 is the perfect place to stock up on study snacks, ranging from giant Red Bulls to king-sized Peanut M&Ms. And if you’re done with studying for the night, swing by the convenience store to pick up a Slurpee and celebrate a job well done.